Choose “Aweber” from the i) Embedded Thermometer type drop down box. Add / edit the Autotask variables as shown below. These variables will provide identifiable feedback and dictate which data is captured alongside Customer Thermometer rating. Additional Aweber variables for capture can be found here. Click “Generate HTML” and copy the code generated. Head into Aweber and create a new message. 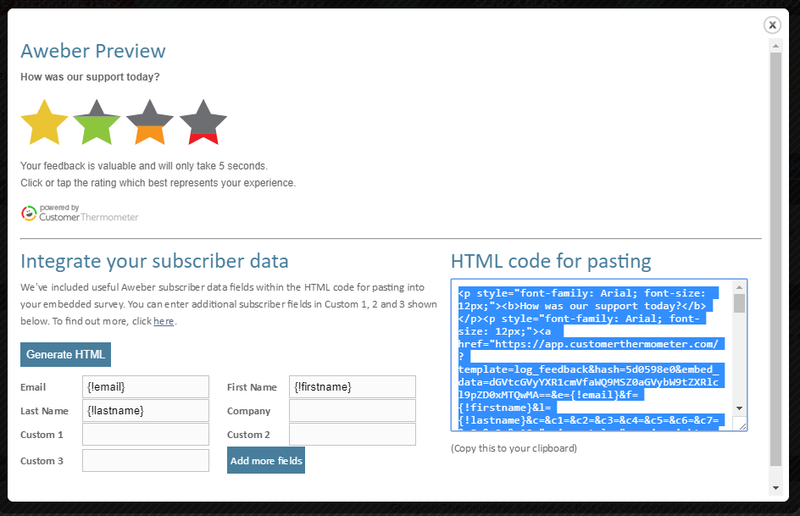 Follow the instructions on this Aweber help page on adding HTML to a message. At section 4 – the HTML source code window, paste in the code copied from above. Your Thermometer icons will now display and track recipient details when sent as a campaign.